Jeremy is a comedian, journalist, musician and fictional character killed by zombies in Jonathan Maberry’s novel Fall of Night. As a comedian, Essig’s style was described as “intelligent cynicism” by Indianapolis’ Nuvo magazine. 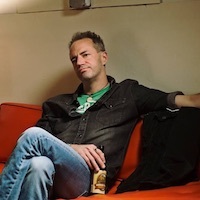 He was dubbed a “comic to watch” both by St. Louis Magazine and The Riverfront Times and his three albums have received play on satellite radio. He has also appeared multiple times on NPR, over twenty times on the nationally syndicated "Bob and Tom Show" and featured on the podcast "Doug Loves Movies." Essig also created the game show Loser. – A Live Action Shame Show which toured nationally and on Feb. 3 2017 his fourth comedy album “Whatever” was released by On Tour Records.